WindSong incorporates the best of urban and rural lifestyles. Our property is rich with indoor and outdoor beauty. Our 34 townhomes are in two long rows facing each other across a pedestrian street. The common house is located midway between the north and south ends. Community streets are covered by a greenhouse-style glass roof enabling us to walk, talk, and play outdoors without getting wet, a significant factor in our west coast rainforest climate! Our building design encourages neighbourly interaction. Our 5,000 sq. ft. common house includes an industrial kitchen, dining room, fireside lounge, playroom with loft and outdoor play structure, an arts & crafts room, workshop, laundry room, community office and board room, multi-purpose (exercise) room, media room, guest room, three washrooms, wheelchair ramps and an underground parking lot. WindSong has a balance of public and private spaces. The dwellings are privately owned and each unit is self-contained with its own entrance and private kitchen. There is ample soundproofing between units. Our design incorporates energy-saving elements such as clustered homes and the glass-covered pedestrian street. Other features include low-flush toilets and environmentally friendly building materials. WindSong has preserved 4 acres in its natural state. Yorkson Creek runs through our forest and wetland areas providing habitat for birds, beavers and fish. Our site features many native plant species. We have organic vegetable gardens, lawns, fruit trees, and play spaces for children. Composting bins are located in the north and south gardens. Recycling bins are located near the main garbage collection area to recycle paper, glass, cans, and some plastic. Beverage containers and batteries are collected inside for drop-off at the nearby depot. WindSong’s ownership structure is Strata. Homes are individually owned and most homes are owner-occupied, much like any other strata townhouse development. WindSong is NOT cooperative housing. In cooperative housing the building is owned by a corporation and the stockholders occupy individual suites that are owner in common. While the terms “cooperative” and “strata” are ownership models, “cohousing” is a model of governance. 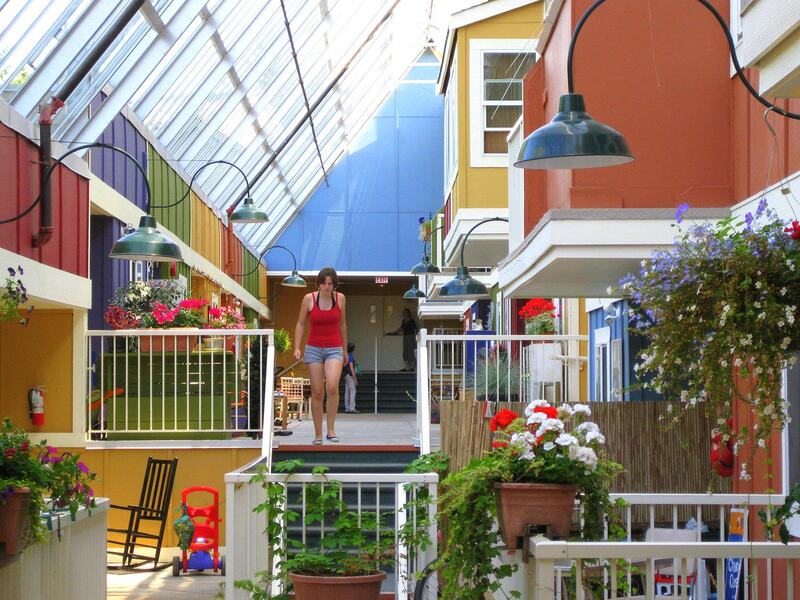 In cohousing, residents are more active in their community and there are usually more common facilities. Key to cohousing is that in governance, community decisions are made through a specifically developed consensus process which has proven to be extremely affective in WindSong’s 20 year history.